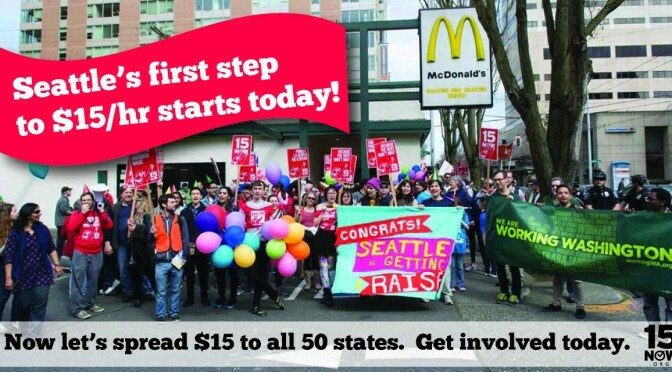 15 Now was launched in January 2014 by newly elected socialist city councilmember Kshama Sawant to transform the widespread community support for $15 into a movement with the power to win. And win we did! Spread $15 to all 50 states by donating $15 today. From January to the signing of the new law, we were there, bringing the voice of workers into city hall and making it crystal clear that we were prepared to take matters into our own hands if elected officials did not deliver. We organized community action groups, rallies, marches, and filed a ballot initiative to keep the pressure on. Even Seattle Mayor Murray admitted in retrospect that our ballot initiative was key to pressuring officials to hammer out a deal. For the next several weeks, 15 Now, unions and supporters will be distributing information to let workers know what they are entitled to, and a hotline to call if they have questions or are not being paid the new minimum. Contribute to our campaign today with a donation to help supply hundreds of activists with leaflets, along with advertisements on King County Metro buses and in local media. Help us make sure workers know they are getting a raise and they should not be fooled by the lies of big business or the corporate media. 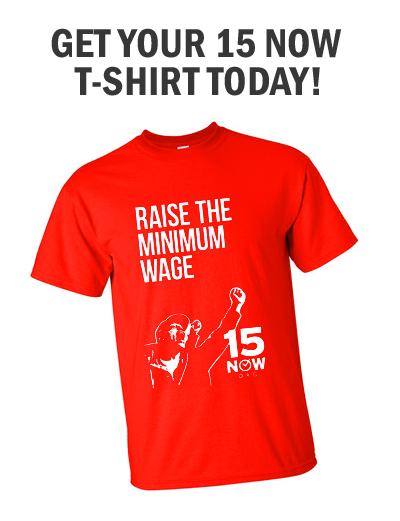 15 Now now has major campaigns for $15 in Oregon, Minnesota, Philadelphia, PA, and a pioneering campus campaign launched by students at Northeastern University. 15 Now has chapters in over 2 dozen cities. Get involved in 15 Now today. April 15th – National Day of Action for $15 – Go here to find an action in your city. Previous PostFight for $15 in All 50Next PostSeattle – King County Metro’s April Fool’s Joke?